Why do we seem to shy away from circles? Are sewing curves really that difficult or is it all in our heads? I admit, I've avoided circles. I think it reminded me of those days as a kid trying to learn to put in a sleeve, until one day I put my mind to making pieced circles and low and behold, I found it wasn't impossible, in fact, it wasn't that hard at all. I've tried all kinds of methods to make circles and they all seem so complicated. And then there is the glue, starch, freezer paper or fusible web. None of those methods have worked for me. I don't enjoy hand sewing so applique really isn't my thing and I don't really like the look of machine appliqued circles. So what's a girl who loves circles to do? Piece circles the old fashioned way. All it takes is a couple of pieces of fabric, a few pins, a little patience, some practice and a big dose of determination. I'll bet you can do it too. Here's how it works for me. For the quilt I'm working on now I'm using half circles to make a circle in a square block. If you're doing circles for the first time, I'd recommend you work big. Start with a large template and when you get some practice move to making smaller circles. The template I'm using makes a 14" block. I made my own templates. *Find a template for a circle block. Lots of books have quilts that require pieced circles. *Get some delicate pins, small and short. I have special small pins that I use for piecing circles. The long pins I use for quilting don't work well when piecing circles. *Choose your fabric and use your templates to cut your pieces. I'm working with a curve, don't try to make it straight! This should be your mantra for working with curves. Folks have trouble with curves when they try to treat them like they do straight lines. Let your fabric curve. Here are my pieces cut and ready to go. To help me pin my pieces accurately I fold my pieces into fourths and press in those lines to use as registration marks. The folds on each piece will be matched up to help you pin the two pieces together. 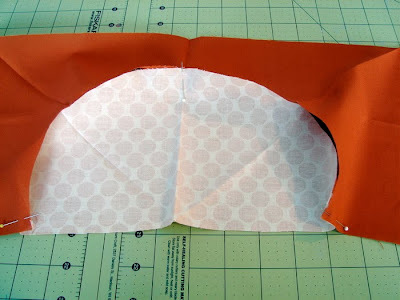 Start by placing the half circle right side down lining up the center fold and the edge. Put in a pin at the center fold. After you have all your other pins in, make sure to change this pin to the other side when you're ready to sew. 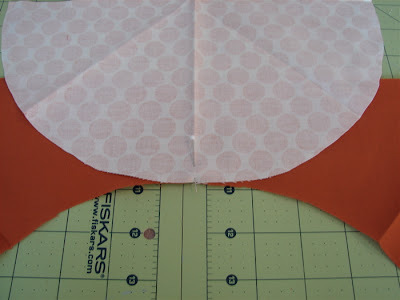 Pin the edge of the half circle to the edge of the square as shown below. Place your pins on the solid fabric side. You're going to be working from that side from now on. Now pin at the other folds matching up the folds and the edges. One hint about pinning. Pin close to the edge of the fabric. This will allow the fabric to give. Now it's time to pin the areas between the folds. 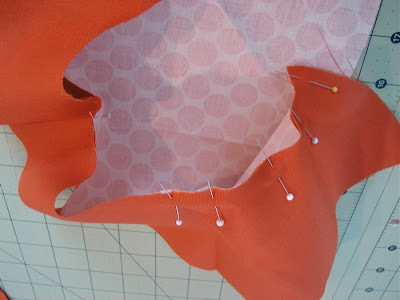 Allow the fabric to form a curve as you pin. The two pieces will nest together, sort of like the curve of an amphitheater. I pin about every inch or so. Don't worry if you have a little extra fabric. You can ease it in as you sew. Don't panic now! Here it is all pinned and ready to sew. I use a 1/4" foot and the dual feed on my machine. It helps move the fabric evenly as I sew. Sort of a walking foot, light. My walking foot is too bulky for this, but you might want to give yours a try. Drop your presser foot, take a couple of stitches, backstitch and take out your first pin. Sew slowly from pin to pin. Stop with your needle down in front of each pin. Don't sew over your pins. It's bad for you and for your machine. Notice how I'm not trying to make the fabric go straight. The only part of the fabric that needs to be straight is what's under the presser foot and about a 1/4 inch in front of the presser foot. 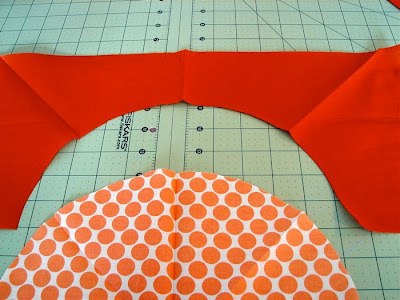 How you use your hands will help you sew this curve effectively. Use your right hand to keep some tension on the fabric. Don't pull or jerk, just gentle tension will help keep the fabric flat in front of the presser foot and will help you ease in extra fabric if you need to. Use your left hand to adjust the fabric. When you've stopped with your needle down, use your left hand to pull the top fabric back and to the left. 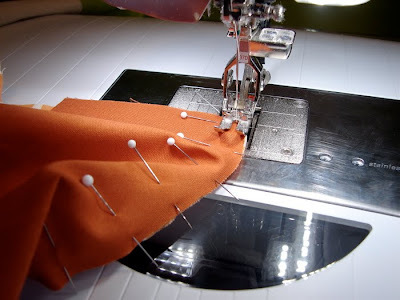 You'll find the rhythm of sew, stop, remove pin, adjust...sew, stop, remove pin, adjust. Notice in the picture below how I'm allowing the fabric to curve. I'm stopped ready to take out my pin. Then I'll use my left hand to pull the top fabric back and to the left. That will make those folds you see almost disappear. Remember, the only area that needs to be flat, without puckers is right under the needle. If there's a pucker above the quarter inch mark it won't matter a bit. It won't be a pucker in your seam. 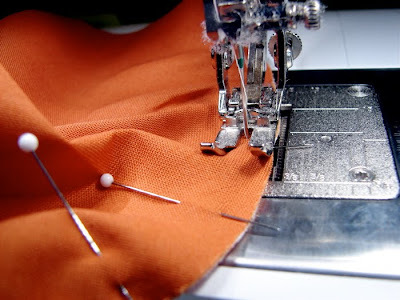 Continue sewing from pin to pin until you reach the end. Slow and steady wins this race! When you're done, press. Make sure you press your seam toward the square. If you have any little puckers, use that steam and maybe some Best Press to make them disappear. Sometimes the bottom of my circle gets a little wonky. Line up the bottom of your circle and trim. I make the square part of my template just a tish bigger than I need it to be so I can trim worry free. Here are two half circles joined together, ready to be part of my quilt. Do you make pieced circles? What works for you? Another awesome tute - thank you so much, Jacquie!! This is easy to follow and provides great details such as handling puckers, trimming, size of pins, etc. You are a natural teacher! Oh I love pieced circles! you know I do! I use elizas backporch template set ... I love them and I do way less pinning... but I started with lots of pins. Lets do a circle quilt a long! please oh please! *suddenly shy* Or not whatever.... or is this new Improv? I always always put the surround on the bottom when sewing and ease it without the dual feed, letting the bottom feed dogs do the work for me. What a terrific tutorial! Your precise instructions and great pictures will no doubt generate many, many new circle quilts! Awesome, thanks for sharing your talent with us! Have a great day! I think it's just like sleeves - you're right. A stiletto works for me in keeping the fabric moving properly towards the needle. Great photos and a really helpful tutorial. Very nice circles! It reminds me of piecing drunkard's path blocks. 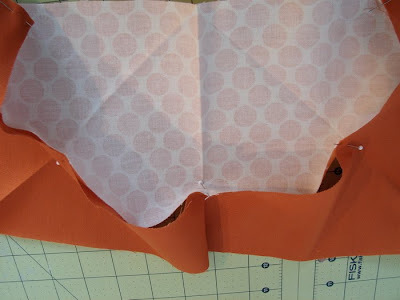 I haven't made any circle blocks but I used the freezer paper method shown on Simply Quilts years ago for setting in squares into blocks which would be very similar to circles. I made a quilt for the Boss (as a gift) using this method. I used all musical fabrics and I did not want to break up the pattern of the fabric esp. the sheet music fabric so I inset the centers of the blocks. I got pretty good at it, but I still had some issues with a small pucker at the corners. Like you said pressing goes a long way in working out those puckers and lots of quilting will take care of the rest. I wish I could leave work right now and go home and sew some circles! Your circles rock! Great tutorial! Love the circles and thanks for the folding and ironing tip. You go girl!! That is exactly the way that I do circles. Easy Peasy! Love what you are working on. this was really helpful. 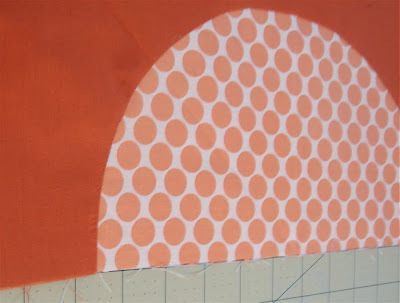 so far I've just appliqued circles on with web and then left a raw edge look...I'd like to try this next. Good tutorial. I luv circles. This is the way I do circles but I also have the fuller piece down and let my feed dogs ease the extra teeny bit in. The better ya get the less pins. Lots of fun. I haven't tried a full circle inset but the halves are nice visually as yours show. Hey Jacquie, Great tutorial! I have sewn circles just like this, in the past, and it worked! You Rock! Happy quilting in the new year! Jacquie, that was very detailed! I just did my first half-circles a few days ago and found that pinning was the key too! I didn't pin as much as you did, but I realize I should if I want to really get rid of those few puckers I got. The template I used was from The Modern Quilt Workshop. Thank you so much for this. I am very very scared of trying curved seams but this makes me believe it might be achieveable. 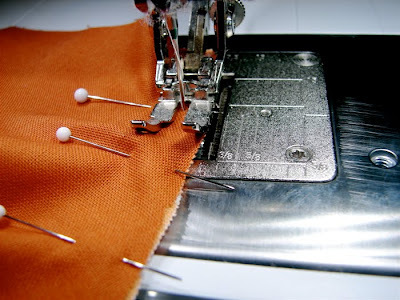 What if you sew a loooong basting stitch on the outside of the seam first? Wouldn't this make it easier to sew the real 1/4" seam? That's a great tutorial!! It made me WANT to piece a circle...that is until I realized why I avoid them to begin with - all the pinning! But I'm bookmarking your tutorial so I'm ready to roll once I take the plunge. I love the colors in your new circle quilt. Sewing circles reminds me sewing in sleeves for shirts. I have tried circles before and used your method, but I am not in for the whole quilt just yet. I'm about to embark on a queen size Robbing Peter to Pay Paul, so this post was a helpful reminder. I've stiched a few Drunkard's Path squares by hand, but haven't done curves on machine yet. I actually enjoy handwork, though navigating pins like that can get prickly. I've done pieced circles exactly once in my life. About two years ago. I did it exactly like you just showed. It was easy. And I hven't done one since. Hhhhmmm, I wonder why that is? Gonna have to do one. Thanks! I love your circles! I just finished a Roundabout quilt and I enjoyed making circles so much! I was fearful of making circles for quite some time, but surprisingly it was so easy! It was a very welcome change from the norm. Thank you for sharing your technique, I like how you made yours so large! Great idea! i love the way the pieced circles look. i am scared of circles and curves...one of these days... actually, i'm ashamed to say that i've had squares cut of b&w fabrics for about a year now that are intended for full circles and a beautiful (hopefully) quilt. half circles look half as scary. thanks for the tutorial on circles. maybe this year i'll get up the nerve to make mine. Thanks for the tutorial. I have made circles before and, like you, prefer the old-fashion type best. These are great and have got my creative jucies flowing. What a FABULOUS tutorial! 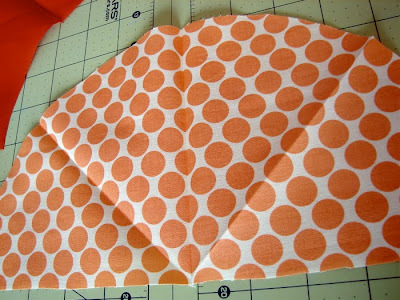 I'll just bet there are lots of quilters working toward perfecting their curved piecing today. Quick question for you.. what about quarter circles? Does one just fold them in half and match to the one line on the base? Thanks so much! It doesn't look nearly so scary now! One dumb question...you mentioned dropping your feed dogs...I'm assuming you raise them again? Thanks for the tutorial. I've done lots of sleeves, but no pieced circles. I wanted to do some when I saw your circle in a cirlcle (using pink daisy dots fabric). I'm putting it on my list of projects! Great circle tips...thanks so much for the info and inspiration! I am new to quilting but this tute is awesome. You make it look so simple. I too have felt this way about circles and avoided them, not any more! Love your work! Beautiful creations. This was a very timely tutorial -- a circle quilt is on my list for the first thing to tackle in the new year! More inspiration to get it going! Thanks! Oh, did I get good practice at this when I made a few New York Beauties! I've now made cirlces/curves this way, with freezer paper and machine applique, the 6 minute circle (which looks like reverse applique), straight fused... You name it, I've tried it. And the preferred method? Depends on the outcome desired. Wonderful tutorial! You're right that it's not that hard - just trying it! Can't wait to see what the finished quilt looks like! Let me add my thanks too. I've made garments with set-in sleeves, but the thought of piecing circles has totally paralyzed me. I think you just helped me get over it and get with it. Gracias por todo! Wow, these half circles are gorgeous! When I do quarter circles, though, I don't pin a bit. Once at the beginning, once at the end, and I put the square piece to the feeddogs and the circle on top, and ease the circle in just like a sleeve. I do trim a bit at the end, but really, I just started doing circles and this was the easiest way for me. Say no to pins! This is an awesome tutorial! I am totally afraid of circles, don't mind applique circles but piecing scares me to death. This tutorial makes them look like they aren't so bad, I'll have to try. Thanks, once again, for sharing your successful techniques Jacquie! What I love most about your project is the sheer size of the circles. They really show off the patterns of those fabrics (which read more like texture) when they are large like that, and on the red ground. gorgeous! thanks so much for the tutorial! I realized I have been a bit scared of curves... but no more! I made my first quilt with circles this winter, using almost exactly the same method as you. Each circle took me an hour and I definitely wouldn't have called them easy. On the other hand, they were really cool. I'm thinking of incorporating more circles in to my quilts, but I'm definitely sticking with big circles and just a few of them. GREAT directions. Thank you so much! Years ago before I even knew about quilting, I got a whole heap of batic fabric and made loads of 1/4 circles in squares. I really didn't know what I was doing but it was similar to what you showed. Only last year did I actually do something with them LOL!!! I made them into an art quilt. I have yet to free motion quilt it but it shows that when there isn't any fear, anything is possible. Your tutorial was fantastic. I am sure the fear is not out of many people's minds. You have made this seem less daunting of a task. I've really wanted to try this for a while, but haven't out of trepidation. Just one question: How do you do the math for this? Seam allowance? 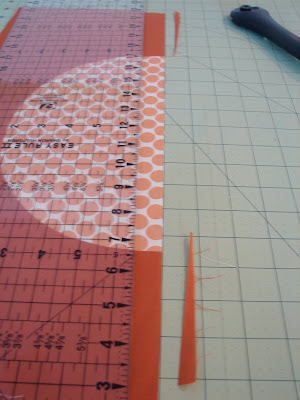 Knowing how to measure and cut for the templates makes me never try blocks like this. This is awesome! I've been wanting to try circles but hand sewing them on is the pits! Thanks for the tutorial. I've done applique circles by hand and also drunkard's path blocks, which is a quarter circle. 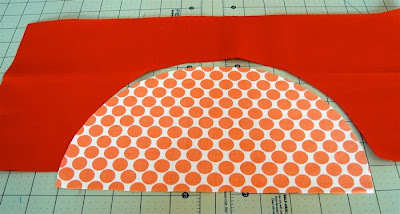 those bias cuts are very forgiving and you're right it just means pinning and patience. I like where you're going with this project. what are you doing with the half circles you cut out of the middle? Great tutorial!! You make it look so easy. But I still have trouble with straight lines!! For now, I will enjoy your work! This was so helpful, Jacquie. Tutorials really do take time from sewing but you are always so gracious to share what you know. I am not a fan of appliqued circles either. 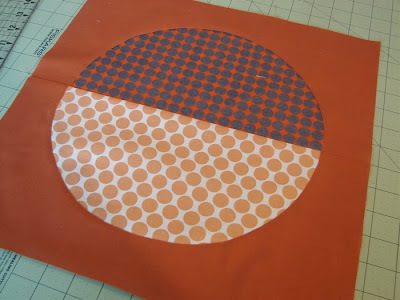 I recently did a circle using reverse applique circle but now I'm curious to try this method. Thank you! Your tutorials are always top notch, Jacquie! Thank you so much for sharing your expertise and your priceless time and efforts. The only circles that I've done are those *freeform* ones that Country Threads made popular a few years ago with their Bull's Eye Quilt. One freely cut the circles...and then stitched them onto their square using a raw-edge type of applique. Good times. i was scared of curves at first.. but now i love them! i've even mastered piecing an entire dot into a square.. oh so fun! I’ve tackled circles cussesfully during classes I have been taking. 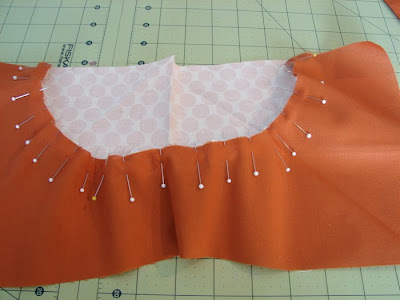 For me it’s all about using lots of pins and giving the fabric some space while sewing the curves. Thanks so much for the great tutorial! I've been collecting bits and peices to make my husband and me lap quilts, and I was thinking something circly for me, but was afraid to try, but that doesn't look too hard afterall! you know...all you need is to gather the circle a bit and you've just set in a sleeve!! important part. sew from the solid/square/flat side. the feed dogs will work in extra fullness evenly all on their own! I've never tried circles before because they seemed impossible.... thanks, this makes them look easy!! Thank you for taking the time to explain this step by step! I have been wanting to learn to piece curves but I with a full-time job and a baby I haven't been able to take a class that would teach me. Now I think I have a good understanding of the process. I'll try it soon. This is so cool! I've been afraid of circles, but your way isn't so scary. Any advice you could offer would be wonderful!! Thanks!! Hi. When I learned to do circles using this technique we were told to add 1/4" to each piece. I notice you did not do that. Is this an omission or is it correct? I LOVE circles and am always on the lookout for designs using them. Hope you can clarify. Thanks. Great tutorial! Thank you for posting it. Earlier today, while perusing a new heritage quilt book received in the mail, I discovered how they used to deal with curved pieces, like Robbing Peter to Pay Paul, back in the early to mid 1800's... they cut the circle or oval shape, sew the straight side into the 1/4" seam and then needle turn applique the curved edge to a block. I want this tutorial in a book! If you aren't planning that, is there a way for me to print it? I love your circles quilts!! !